Hello Internet travelers! It’s been radio silence here on the Greylands for the last week. Lady Grey and I traveled to Iceland over spring break, and we were busy taking the advice of Granger from Fahrenheit 451, who said “Stuff your eyes with wonder […] live as if you’d drop dead in ten seconds. See the world. It’s more fantastic than any dream made or paid for in factories.” We spent some time out there in this gloriously beautiful world, reveling in the unsurpassed glory of creation, and we had a great time. We visited waterfalls, hiked on glaciers, and even snorkeled in a glacial river between two tectonic plates (and that was intense, let me tell you!). It was a really wonderful and necessary break, and sadly now we have to come back to the real world with all of its endless problems. At least there are bright and hopeful comics to keep us company! Today, I’ve got a pair of titles and a trio of stories. I hope y’all enjoy my commentary as we travel farther Into the Bronze Age! Underneath this suitably creepy cover, we’ve got about two-thirds of a really awesome comic that takes a hard left turn right at the climax. The resultant story is a bit odd, but it still ends up being an interesting read with surprisingly sophisticated handling of some rather unexpected themes. Gerry Conway makes his return to scripting DC books, and he is already displaying impressive maturity and skill. The growing seriousness of the Bronze Age is definitely on display in this issue as well. 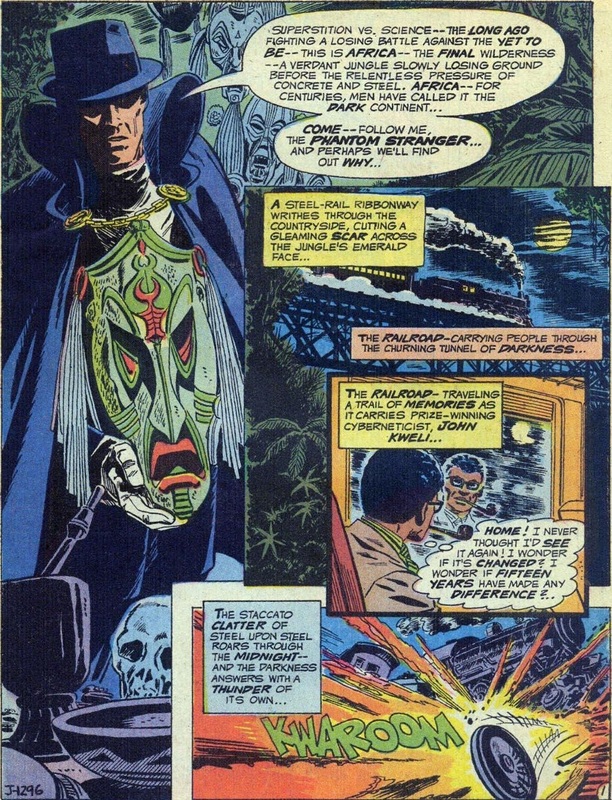 It begins with the Phantom Stranger narrating a string of strange phenomena in the night sky over the western hemisphere, as people all over the world look up and see a sinister triangular shape of purple hanging framed against the stars. Three nights later, the police in New York try to talk a desperate woman down from the Brooklyn Bridge. She has just killed a man, and she screams that she will be her own master from now on. As she rants, she slips off over the side and plunges into the fog, only to vanish before hitting the water. 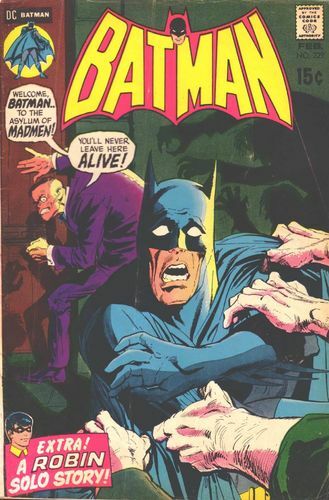 Aparo gives us a wonderfully atmospheric two-page spread of the incident that adds to the mystery. 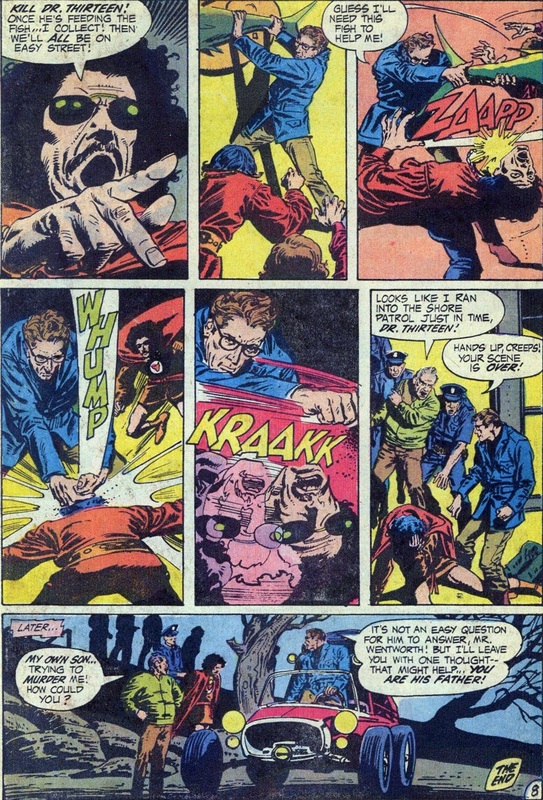 The police are baffled, and the sudden appearance and cryptic warning by the Phantom Stranger doesn’t do much to comfort them. Meanwhile, apparently the Weathermen have taken their bat-guano insanity inter-planetary, as a pair of dropouts have somehow managed to hijack an Apollo spacecraft and are planning to crash it into Washington D.C. in protest of the space program’s ‘waste’ of resources. Really? That’s what you’ve got a problem with? Not the war in Vietnam, the race problems, or police brutality? I’m glad you boys have your priorities right. Despite the pleas of mission control, it seems like this inexplicably capable pair of nutjobs is going to make good on their threats, but the capsule suddenly goes off course and splashes harmlessly into the Atlantic, empty! The Stranger has noticed all of these events, and after spotting a story about a glowing pyramid suddenly showing up in the Sudan, he decides to investigate. How does he get there? Why, by flying commercial, just like everyone else. It’s a weird sight to see the Stranger just walking through the airport. Does he even have a passport? Or money? Either way, on the flight, he meets a young woman named Lynn Berg (Lindbergh reference?) who wants to talk to him because she gets nervous on flights. 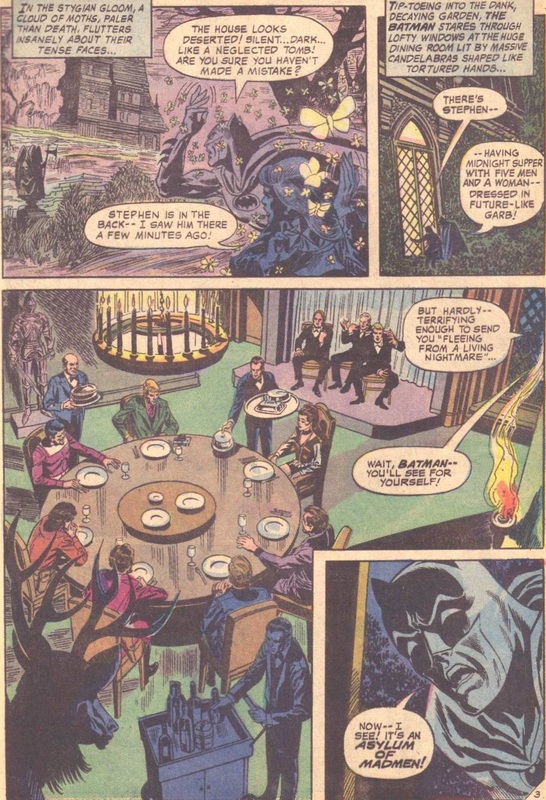 The Stranger’s slightly odd response is perfect, as he says “Feel free to speak.” Not the most warm and welcoming, is the Phantom Stranger. In response, the young woman, consumed by grief and rage, chases after the pair, attacking them, wrestling a knife away from one of them and actually killing him with it! 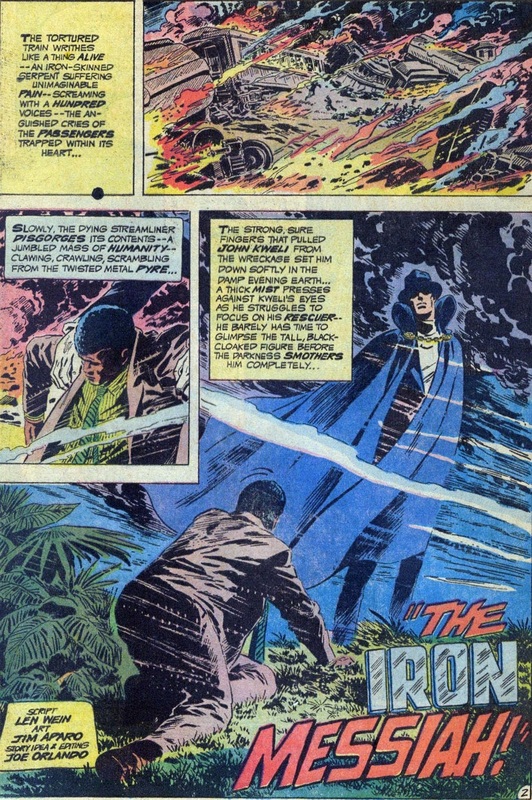 The Stranger sort of ineffectually calls after her and watches helplessly (which doesn’t really make a ton of sense), as the dead terrorist drops the grenade he’d been holding, causing an explosion and apparently vaporizing Lynn. This is an incredibly effective scene. Just as the traveling companions are talking about war and the cycle of vengeance, that very cycle plays out before our eyes. In revenge for some unknown act that cost them their father, two men kill an innocent. In response, the dead man’s sister is herself blinded by vengeance and kills one of them, dooming all three. It’s a powerful and surprisingly subtle demonstration of the endless nature of revenge. The effect is rather arresting. But, this is a comic, and we’ve got other, stranger fish to fry, so the scene shifts to that mysterious glowing pyramid our enigmatic hero read about. Inside, a masked figure in Egyptian regalia holds forth to a gathered crowd, explaining his evil plan, and evil it is. In attendance are all of those people warped by hatred and selfishness who were snatched away from their deaths, including the girl from the bridge and the two pseudo-astronauts. Evil-tut explains that he is the ‘Messiah of Evil,’ and has drawn all of them together in order to build ‘an army of evil’! Strangely, Lynn Berg is in a cell there as well, drawn thither because her heart was filled with hate at the moment of her death. Suddenly, the Stranger is there in her prison, and he comforts the girl. Just then, guards burst in, and when the Spectral Sleuth tries to fight them, he encounters a powerful force-field. What’s more, they knock him out with just a touch, which also seems odd. The Stranger is brought before the fiendish pharaoh, who reveals himself to be…Tannarak! That’s right, the promising villain from the last issue returns, and in grand fashion! Apparently, at the moment of his death beneath the falling statue, he was snatched away by powerful beings who called themselves the ‘Gods of Hate,’ who chose him as their champion, as the Messiah of Evil and charged him to build an army of the like-minded with which to seize power. The Stranger shouts that such an agenda would “upset the very balance of the universe” and invokes the concepts of chaos and order, declaring “this must not be!” He strikes down the guards, somehow now able to do so, despite the fact that a few pages before he couldn’t’ even touch them, and then charges Tannarak. Yet, the sorcerer is not to be taken so easily, and he zaps the hero with a beam that turns his own hate and anger against him. The mysterious one realizes that his rage is self-defeating, so he calms his mind and strikes out, not in anger and not for revenge, but for justice, and delivers a great blow. Yet, he and Lynn are still badly outnumbered, so they flee, and here is where things get weird. Well…weirder, in context. They race into a chamber filled with advanced machines, alien machines! They trigger a defense mechanism and are bombarded by terrible rays, but each selflessly tries to shield the other. Wow. Okay. Where to even begin with a story like this? It has some really fantastic elements, and the scene with the terrorist attack is unquestionably quite strong and touching. There’s probably no clearer symbol of the endless cycle of vengeance in the modern imagination than the conflicts in the Holy Land, and that scene was handled with surprising maturity and subtlety. I love seeing Tannarak return as well. I think he’s got a ton of potential, and his being chosen as a champion of evil makes perfect sense. After all, he was a completely selfish being, putting his own continued existence above every other concern, and what is evil but the ascension of selfishness, the triumph of will? At the same time, that’s why the trappings of his ‘army of evil’ were slightly disappointing to me, as I’d have liked to see just a slightly more sophisticated treatment of their morality. Evil very rarely owns the fact that it is evil; instead, it is much more common for that type of utter selfishness to hold itself up as the greatest good, as it so often does in our own society. Of course, then there’s the alien element which just comes out of left field. Why not just have Tannarak’s backers be mysterious and sinister beings? Making them some kind of aliens just doesn’t fit with the rest of the story, and it certainly doesn’t fit with the Egyptian motif without some type of explanation. Tannarak was raised in Egypt, so we could have just hand-waved the pharaoh act if left to his own devices. Add to this the different moments that just don’t quite make sense, like the invulnerable guards suddenly becoming conveniently vulnerable and the Stranger’s unexplained commercial flight, and you’ve got a very uneven story. 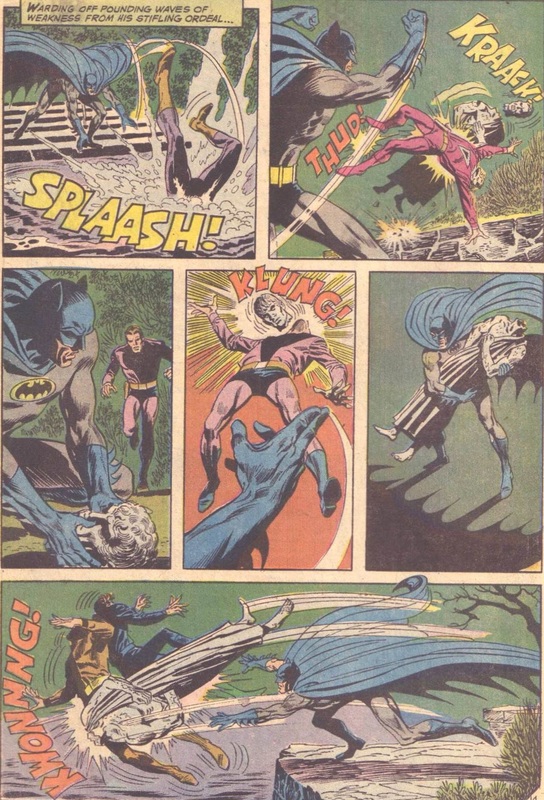 All of those rough edges could have been smoothed over with a bit of thought (perhaps the Stranger took a dive in the first fight, and perhaps he was on the flight to keep an eye on Lynn), but we don’t get any such attention in the comic. In the end, it’s a story with a ton of potential, but the final result is just a bit too clumsy. I’ll give it 3.5 Minutemen on the strength of its treatment of its themes, but it loses plenty because of its oddities. We’ve got a super gimmicky cover, once again focused on a troubled wedding for the Man of Steel and the glamorous girl reporter, which seems something of a tradition for this book. While the story inside isn’t quite as gimmicky as its wrapping, it is more than a little weird. The strange tale opens at the home of Sir Noel Tate, a wealthy man who Lois is interviewing. However, when we join them, they have put the question and answer session on hold in order to investigate sounds coming from the old fellow’s souvenir room. 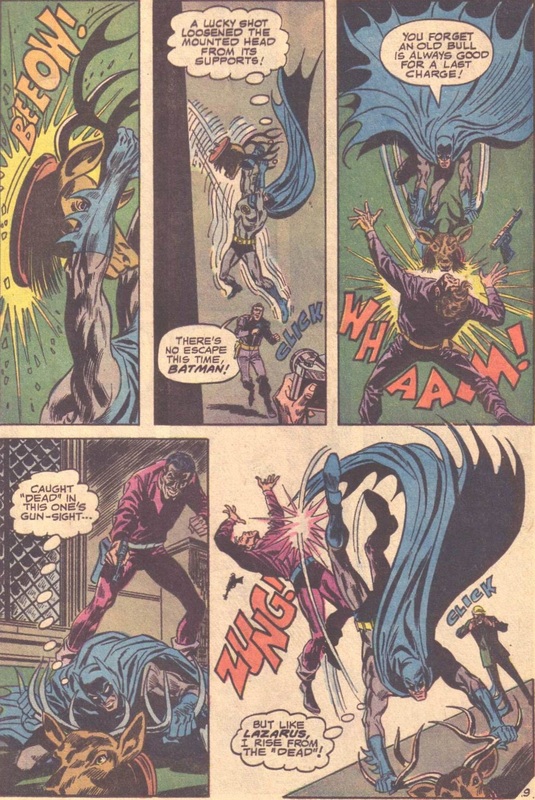 They interrupt a trio of thieves in the process of robbing the join who knock Tate out and begin to threaten Lois. The plucky girl reporter holds her own for a while, but just as one of the thieves is about to skewer her, mysterious things start to go wrong for him and his confederates. They’re attacked by an unseen assailant and driven away. When Tate comes to, he tells Lois that she’s in danger…from a ghost relative of his! Interestingly, Lois scoffs at the idea of ghosts, as if that’s even slightly less believable than half of the ridiculous stuff she encounters on a daily basis. Back at the Daily Planet, Sir Noel’s efforts to warn the journalist are intercepted by an invisible presence. It apparently possesses Jimmy to lure Lois out of her office, then poses as her on the phone to Tate. Next, for some reason, it draws Lois into the slums of the city, where she observes an interesting scene. A desperate young man holds a slum-lord at gunpoint, and despite the fat-cat’s pleas for mercy, the gunman insists that he’s preyed on his tenants too long and too viciously to be spared. 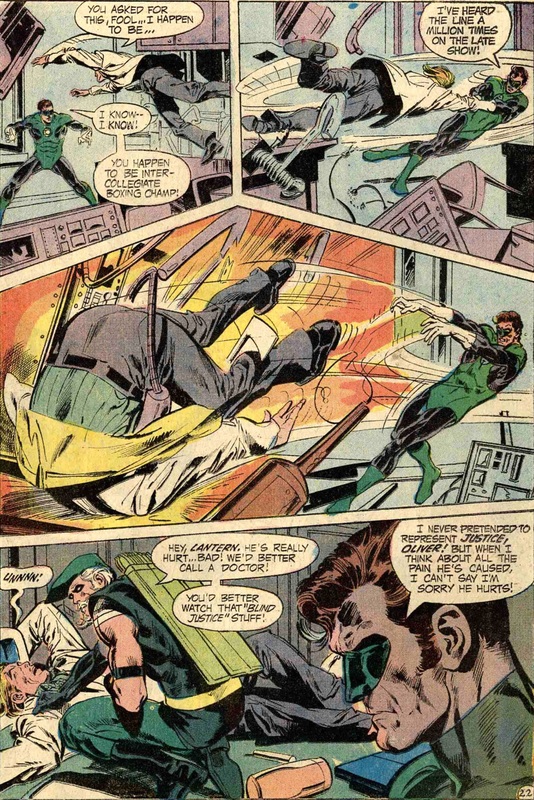 It’s a scene somewhat reminiscent of the infamous Green Lantern/Green Arrow #76. What makes this moment fascinating is the social commentary present in it. 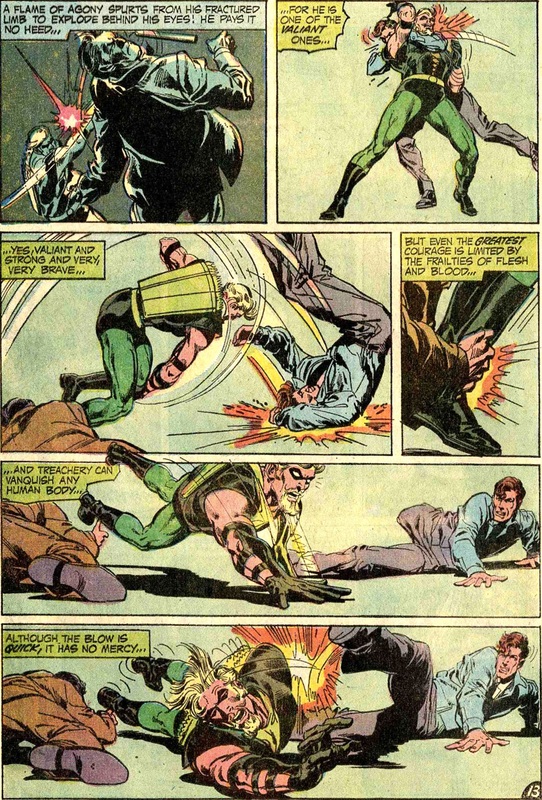 There’s nothing really sympathetic about the slum-lord, despite the fact that he’s got the law on his side in this encounter, and it is implied that men like him are the reason for the deplorable conditions in the slums. Before the would-be murderer can finish his grim deed, his landlord has a heart attack and dies, courtesy of the mysterious ghostly suitor, who is himself moved by the plight of this area. Cryptically, he mentions how it reminds him of London’s East End from 83 years ago. Meanwhile, Superman arrives for a romantic dinner with Lois, and we get one of the strangest scenes in the book. After the couple shares a kiss, the ghostly stalker realizes that he’s got some pretty powerful competition. So, he uses the power of plot to conjure a vision of Kal-El’s mother, Lara, in Lois’s eyes. The vision is super vague, but it’s presents the Kryptonian woman in horror at the approach of something, and this creeps the Man of Steel out. When Lois starts laughing uncontrollably, he freaks out and almost hits her! Horrified at his reaction, Superman flies away in disgust. The whole scene is just odd. It doesn’t really make sense, at least in part because the ghost’s powers are so vaguely defined that we’re not sure what is his doing and what is reaction (or overreaction). The end result is just rather disjointed and seems like a clumsy excuse to get the Metropolis Marvel out of the picture. That night, Lois has a nightmare about her wedding with Superman being interrupted by her spectral suitor, only to awake and find a letter from his ghostly hand that declares he’s going to bring her to his spirit world soon. Despite her best efforts, the ghost prevents the desperate reporter from revealing her plight by stealing her voice and freezing her hands, and the next night, he summons her to Sir Noel’s estate, where she steals the knight’s nefarious ancestor’s dirk. A frightened Tate calls Clark Kent in search of Superman, but before the hero can arrive, Lois is transported back through time to London’s East End in the 19th Century, through the ill-defined power of the ghost and his dagger. She arrives and is confronted by a mysterious figure emerging from the mist, but just as he’s about to stab her, he declares that she’s “not like the others.” Lois realizes that her spectral suitor is none other than the ghost of Jack the Ripper! 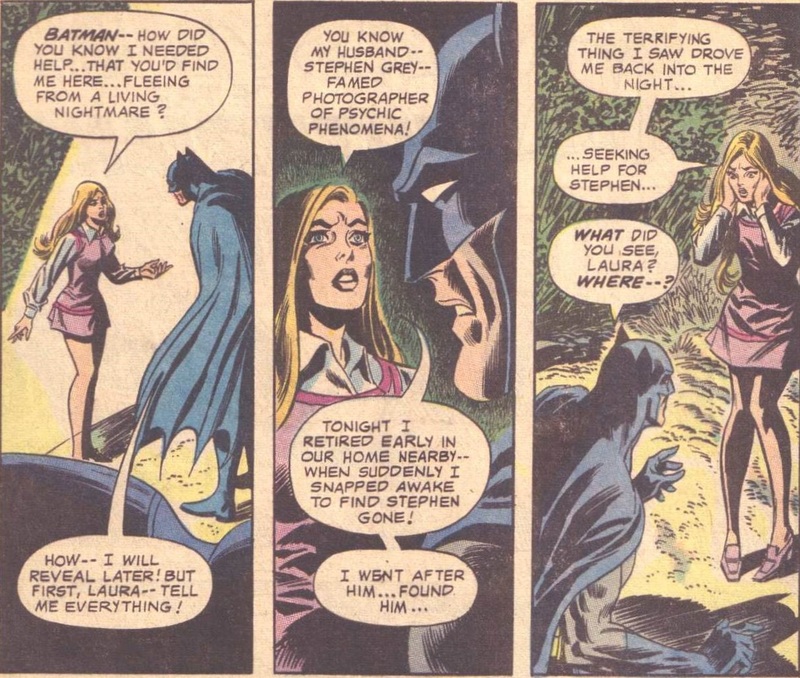 Just then, Superman arrives, having scoured time to find her (and I like the detail that he didn’t know exactly when to look), and takes her home, where Sir Noel fills in the blanks. Apparently, his ancestor was driven mad by the deplorable conditions of London and set out to punish the women who represented those conditions, the prostitutes who walked the streets, which seems pretty monstrously unfair. The ghost sent Lois back so that his living self could kill her, but the Ripper realized that she was an innocent and couldn’t bring himself to do it. Confused yet? 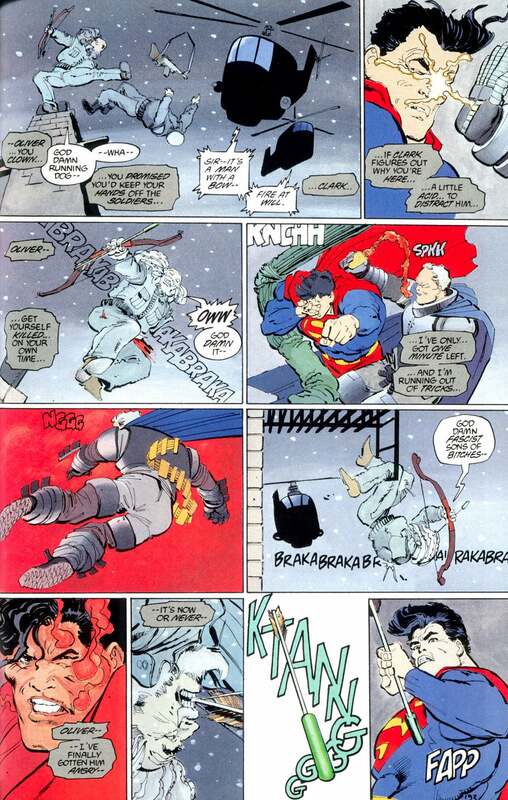 Fortunately, the dirk was destroyed when Lois was sent back in time, so the spirit is now banished for good. This is just a weird, wandering tale. It has some effectively creepy elements, and there is some definite menace as poor Lois is hounded by her invisible, unstoppable stalker. The fact that a story featuring Superman manages to conjure up that sense of helplessness is actually fairly impressive, but the plot is just too random and too rushed to be entirely effective. 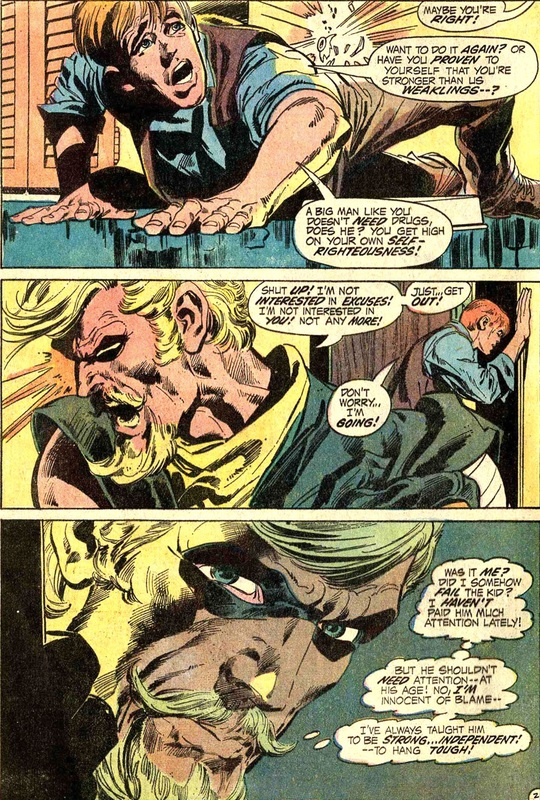 Even Werner Roth’s usually beautiful art isn’t quite up to the standards we’ve gotten used to in the last few issues. There are several spots where his figures seem awkward and stiff, especially his Superman. 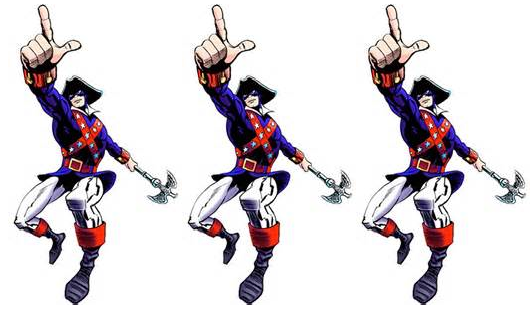 I’ll give this one 2.5 Minutemen. It isn’t bad per se, just a little off. Unfortunately, this issue’s Rose and Thorn backup isn’t much better. The usually impressive series suffers from some really goofy elements and an altogether rushed plot in this outing. 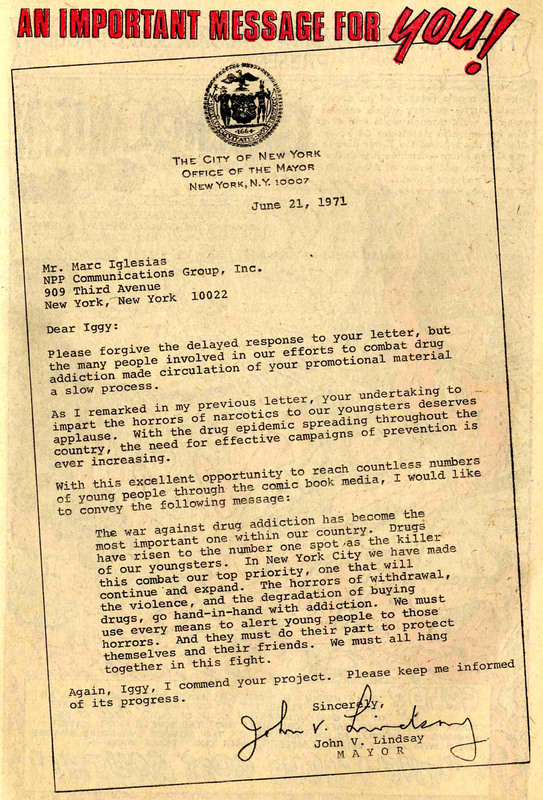 It begins, strangely enough, with the strip’s protagonist dead! Lois and Superman look on as the valiant Thorn lies dead in her golden coffin, apparently finally having fallen prey to the 100. We then get a flashback that tells us how the Nymph of Night met her fate. She cornered #24 on her hit parade and took him out in an alley, only to…die…somehow…because of car exhaust? It’s an exceedingly silly scene. Thorn is standing in an alley when the killer’s partner backs his car towards her. Does he run her down? Pin her against the wall? No, don’t be silly. He stops next to her and poisons her with carbon monoxide. Now, I know that emissions standards were worse in the 70s, but I’m still thinking that simply running your car in an alley didn’t create the equivalent or mustard gas or anything. It’s such a ludicrously impractical way to kill someone and so unnecessarily complicated that it takes you right out of the tale. After the Thorn is killed, the 100 apparently take her body back to their funeral parlor front, not bothering with the authorities or anything, and nobody notices that there’s a murdered woman just sitting in the front window. Later, a woman with the “Friends of the Friendless” comes to claim the body. She’s a member of the 100 who is playing a part, despite the fact that the funeral parlor’s owner is their leader, which doesn’t make much sense. The whole sequence feels unnecessary, as the killers could have just taken her body and done whatever they wanted with it, skipping this whole dog and pony show. The criminals bring the boxed Baleful Beauty to a sinister looking old house called ‘The Mansion of Mourning,’ which is an admittedly cool name. It’s a front for the 100 as well, providing a hideout for their wanted members. As they prepare to plant the Thorn in a grave, her perfidious pallbearers drop the casket, and rain splashes on her face. Suddenly, the Vixen of Vengeance revives! She rises from the grave in a pretty fantastic panel that, if the story had more space, would have made a great splash page. Apparently, the vigilante took some medicine to fake her death when she realized she was trapped, and she claims she always wears nose filters which prevented her from asphyxiating. Ooookay. Well, the Thorn makes swift work of the gathered hoods in a nice full-page action sequence and then drops another set of numbers on her newest catch. 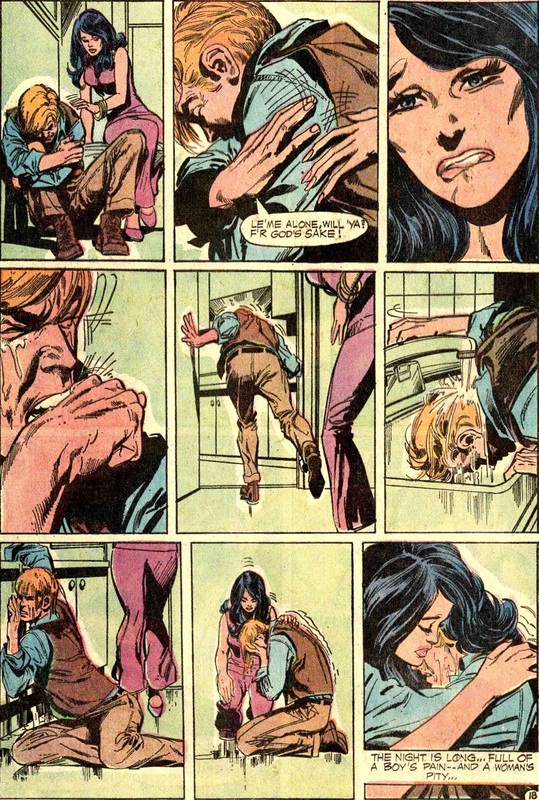 Returning home, she awakens as Rose, who finds herself weeping at the news of the vigilante’s death, despite the fact that she doesn’t know her. This story has some great elements. 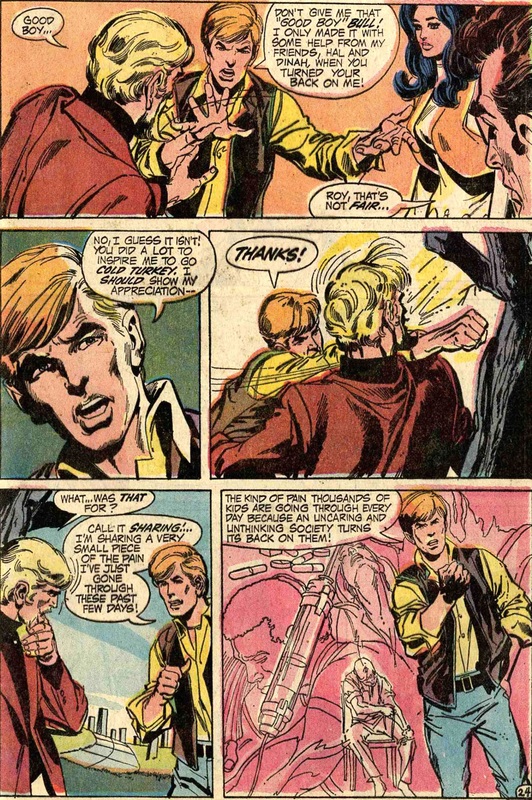 In fact, the big reveal of the Thorn’s return from the grave and the last moment with Rose’s unexplained connection to her alter ego are both quite good. Yet, the story overall is a bit on the weak side. 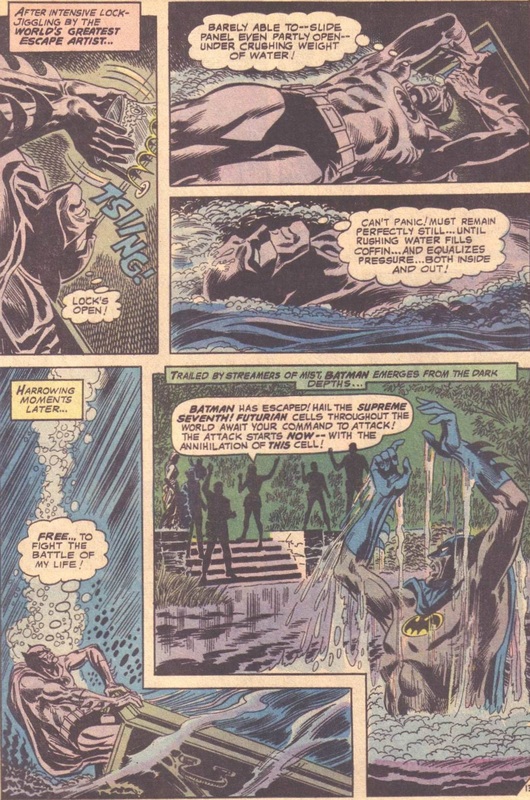 It’s clear that Kanigher is really struggling with his page count in this one. While he’s done a great job at creating condensed, simplified plots that worked remarkably well in only 8 pages, this issue’s effort is just too convoluted. The silly method of the heroine’s “death” combined with the unnecessary complications involving her burial and the funeral parlor break too much with verisimilitude without explanation or excuse and they take away from an interesting story idea. The resulting yarn is worth only a substandard 2 Minutemen. I hope you enjoyed my coverage of these two comics. We’re almost done with February, just three more comics to go! In the next post, we’ll see what Denny O’Neil’s got in store for his Superman revamp, which I’m excited about. I hope you’ll join me again soon for my coverage of that and more! Until then, keep the heroic spirit alive!